Highest sensitivity, lowest background POLYVIEW ® nanopolymer detection reagents for use with HIGHDEF ® chromogens. Formalin fixed paraffin embedded human tonsil double stained sequentially with CK 5/14 mouse antibody, labeled with POLYVIEW® IHC reagent (mouse-HRP) (Prod. no. ADI-950-112), seen with HIGHDEF® IHC substrate (DAB, stable) (Prod. no. 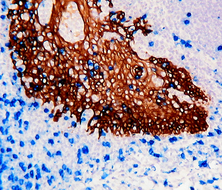 ADI-950-212); then CD8 mouse antibody labeled with POLYVIEW® IHC reagent (mouse-AP) (Prod. no. ADI-950-110), seen with HIGHDEF® blue IHC chromogen (AP) (Prod. no. ADI-950-150) to produce a contrasting brown and blue image.